... But that doesn't mean you need to live at the mercy of this disease! functioning and health of your skin! Most rosacea sufferers know from experience... your outbreaks come in cycles. You might be "clear" or "okay" for a month or two. But it's never long before another series of triggers (stress, diet, hormones, soap, etc.) set off your hyper-sensitive skin into yet another painful, embarrassing series of symptoms, leaving you feeling humiliated, frustrated, and helpless. Especially since your symptoms seem to get worse, the longer your rosacea is left untreated. If you suffer with rosacea, you likely describe your skin as being "sensitive" to environmental factors that trigger outbreaks. The solution to this problem should be simple -- a barrier cream that protects your skin! Unfortunately, according to a survey done by the National Rosacea Society, a full 82% of rosacea sufferers are also sensitive to many common skin care products! So that's why, in the formulation of Skinception™ Rosacea Relief Serum, special care was taken to choose ingredients that would provide the necessary skin barrier protection... without also "locking" common outbreak triggers like Vitamin C against your skin! ... Blood vessels become inflamed, and over time this results in an overall degeneration of your vascular health (i.e. the blood vessels below your skin) causing redness, inflammation, spider veins, prickling heat below the skin, and more. So Skinception™ Rosacea Relief Serum has been formulated with ingredients that help to restore a normal sensitivity threshold to the skin while also promoting vascular health. Plus, it includes ingredients that protect against free radicals, another common trigger. ... Which all adds up to additional damage to your skin's health and function. Skin tissue thickens and irregular prominent veins become visible! That's why Skinception™ Rosacea Relief Serum includes a series of ingredients that work together to help prevent inflammation before it starts, aiding in the reduction of long-term potential damage. Something not talked about as frequently, yet still concerning, is that rosacea puts skin in a chronically inflamed condition that actually speeds up aging. Inflammation damages the collagen matrix, which is the biggest cause of aging skin. Yet most anti-aging products are actually too harsh for rosacea-prone skin, with ingredients that only provoke further inflammation. That's why Skinception™ Rosacea Relief Serum has been carefully formulated with an eye to reducing inflammation and naturally helping to regenerate and protect the collagen matrix while rebuilding your skin's resilience. This, in itself, has anti-aging benefits while also offering relief from your rosacea. Clinically Proven To Decrease Redness By Up To 90% In Test Subjects! ... It's strictly formulated to meet the specific needs of rosacea sufferers, each ingredient chosen based on the very latest medical and scientific research into the treatment of rosacea and it's associated symptoms. For example, it includes the active ingredient Renovage®, which has been clinically proven to reduce redness in 90% of rosacea sufferers by at least 30%! 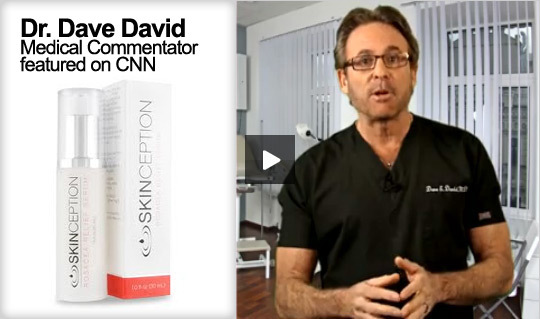 To read more about the Skinception™ Rosacea Relief Serum formulation, click here now. RISK FREE For 90 Days! Skinception™ doesn't just treat Rosacea! Skinception™ all-natural, all herbal, all safe line of anti-aging and anti-wrinkle skin creams and lotions assist with the symptoms of a wide variety of skin ailments, including combating signs of aging, removing wrinkles, removing crow's feet, dark circles, or other eye blemishes. For more information on the best products for taking care of your skin go to Natural Health Source.com.